There are so many apple recipes to love! 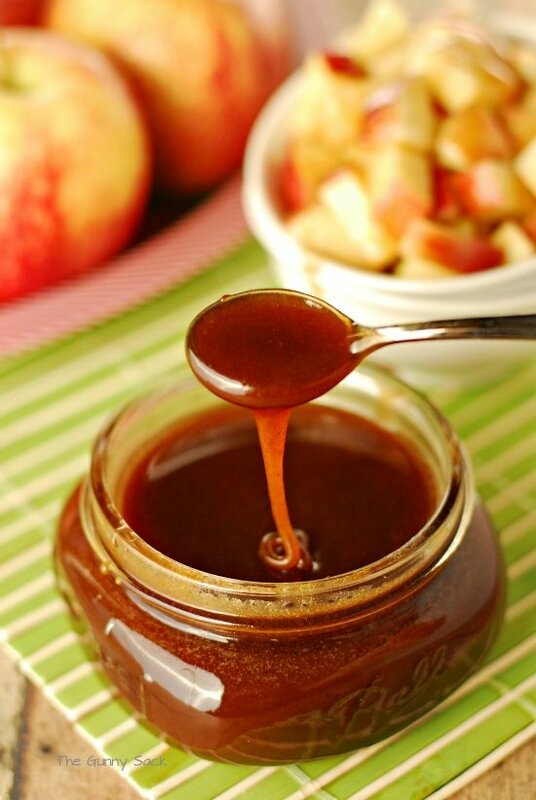 How about Cinnamon Buttermilk Caramel Syrup for fall apples? When I was a kid, we had an apple tree in our backyard. It seemed to be both a blessing and a curse. My mom took care of the tree so that the apples would be useful and for the most part worm-free. The kids in the family had to collect and dispose of the rotting apples on the ground around the tree. The great thing about the tree was, of course, that we had apples every fall. We would collect all the good apples and we consumed them in various ways. We ate them plain, covered in caramel and in baked apple recipes like apple pie and apple crisp. I have a sweet memory of my grandma coming to our house to help my mom freeze apples. My mom had an apple peeler/corer/slicer. We spent an entire day peeling apples and preparing them for the freezer. I don’t remember what my mom added but I know that she did not turn the apples into apple pie filling. The apple dessert I remember my mom making most often that winter was Microwave Apple Crisp using the apples we had frozen that fall. 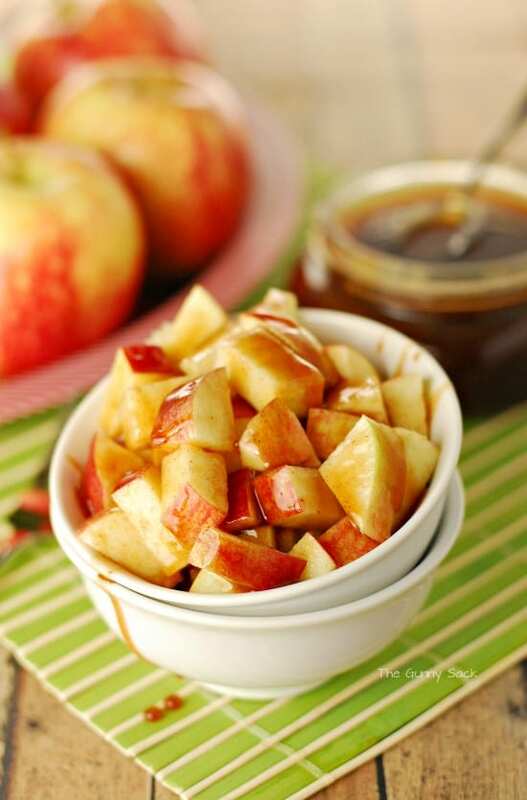 But one of our favorite ways to eat apples was to slice them into bite sized pieces and drizzle them with warm caramel sauce. 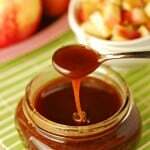 Today I am sharing a recipe for Cinnamon Buttermilk Caramel Syrup. The cinnamon and nutmeg give this outstanding caramel recipe an added touch of fall. Besides being used on apples, the syrup can be drizzled on apple desserts like Apple Bars with Pecans . I’ve also used as an ice cream topping! Check out that blog post to see more pictures of how the caramel looks while it is cooking. It’s one of the most fantastic carmels I’ve ever made . Thank you for sharing the recipe. Can’t wait to try the 3 apple related recipes I found on Facebook from one of my friends. Thanks for sharing. Would be curious about the canning info also. I was wondering if this or any other carmel sause can be caned and how long do you boil it in the bath. Sorry, I’ve never canned so I’m not sure! Best of luck and thanks for stopping by! Can this be canned using a boiling water canner? I’ve never canned anything so I am not sure how that would work. Thanks for stopping by! Satan in a jar. Pinning it. YUMMY!! We had apple trees growing up too….but it seemed like ALL the apples were rotten! We would still collect them and my mom would cut around all the bad spots to make apple sauce…..lots of work, but so good! I think that is why my mom took care of the tree. She had to spray for bugs, prune the tree, water it, etc. I don’t think she ever tried making apple sauce though. Thanks Cathy! I would never have thought of the cinnamon and nutmeg with caramel, but that sounds so different and heavenly! I want to try this over the weekend! Thank you for this post! Thanks Toddie! I hope you enjoy it! I am so in love with this Tonia! Gorgeous! What a great idea – I love the addition of cinnamon and nutmeg to the caramel! I will definitely be trying this. Pinned! Thanks Lindsay! I love cinnamon and nutmeg!